Consistently taking good care of dental implants is important for long-term success. With proper oral care and professional maintenance, implant-supported teeth can last for many years without any problems. Nowadays, there are various types of dental implants in Leeds and some of them may require a different home care routine. Experienced dentists such as Enhancedental will offer targeted advice and propose a range of cleaning products to make oral hygiene with dental implants in Leeds a breeze. When looking at home care instructions for dental implants, it is important to have in mind that dental implants require the same amount of care as regular teeth. Keeping the tissue and implant connections clean is vital for the proper function and longevity of dental implants. Unlike natural teeth, dental implants cannot develop cavities on their surface. However, they are prone to peri-implantitis, which is basically a type of gum disease for dental implants. Peri-implantitis can loosen the connection between the tissue and the dental implants leading to premature implant failure. Peri-implantitis can be caused by poor oral hygiene or inflammation. Patients with dental implants should clean their teeth at least twice a day with a soft toothbrush and not forget to floss, especially in-between their dental implants. Powered toothbrushes are also beneficial because they allow patients to focus on specific interfaces of the dental implants. Water flossing offers another effective way to get rid of plaque and keep teeth and dental implants healthy and strong. As a matter of fact, water flossing is more comfortable for patients with dental implants, since it does not irritate the gums and soft tissue. Last but not least, patients experiencing grinding problems, can opt for mouth guards to prevent bone loss. With the ongoing popularity of dental implants and the possibility of peri-implantitis, educating patients in proper oral hygiene is crucial. A dentist can improve a patient’s oral health and implant health and decrease the possibility of implant rejection or premature implant loss. 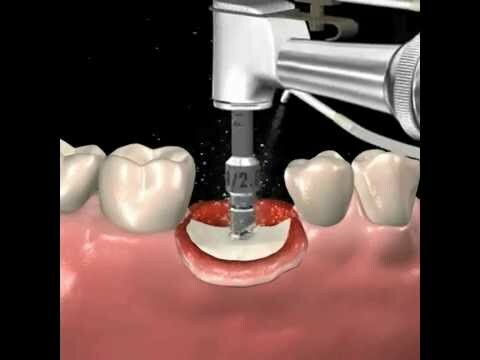 These steps combined will ensure that dental implants will be in great condition for many years to come.